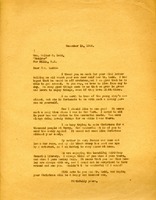 In this letter to Mrs. Sturgis, Miss Berry lets her know that she will be leaving for New York on November 23rd. She requests that Mrs. Sturgis wire her what time she has engagements on the next Monday. 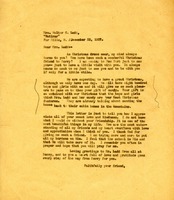 Mrs. William Sloane sends a donation letter to Martha Berry for the amount of $150. 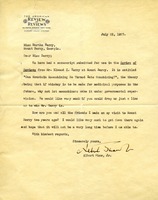 Letter to Martha Berry from Albert Shaw, Jr.
Albert Shaw, Jr. from The American Review of Reviews asks Martha Berry for information about the author of a submitted manuscript, Mr. Elwood I. Terry. 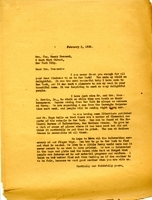 Terry's manuscript contains a theory that if whiskey can be utilized for medicinal purposes moonshiners should be permitted to make it under governmental supervision. Shawinquires as to how Berry is doing and says he would like to visit Mount Berry again soon. 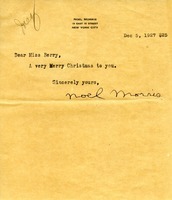 Christmas wish note with $25. 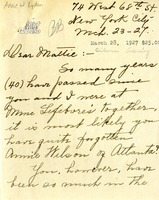 Letter to Martha Berry from Annie W. Lyden. Mrs. Lyden discusses the forty years that have passed since she and Martha Berry attended Madame Lefebvre's (sic) school together. She also donates $25 towards Berry's Silver Anniversary. 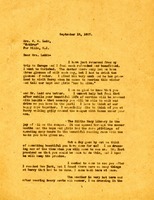 In this letter Martha Berry thanks Mrs. Ladd for everything that she has done for the Berry Schools. 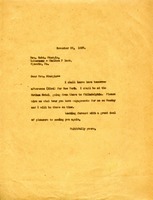 Martha Berry also tells Mrs. Ladd that she will be coming up to New York to see her. 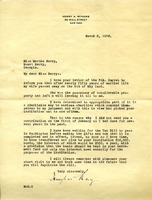 Martha Berry asks Mrs. Rothschild for help with raising money for the re-building of the dormitory at the Foundation School. Berry says that even though she knows Mrs. Rothschild is very busy, she believes she is "the kind of person who can always do one more thing." This note from Mrs. Paige is requesting that Miss Berry send a pamphlet about the schools for fundraising purposes. 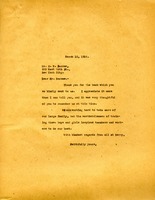 Letter to Mrs. Henry Marquand from Martha Berry thanking her for interesting her friends in The Berry Schools. She informs Mrs. Marquand that she will use Mrs. Meyer's gift to rebuild the dormitory. She also informs Mrs. Marquand that she will be with Mrs. Hammond at Mt. Kisco and then go from there to Chautauqua. 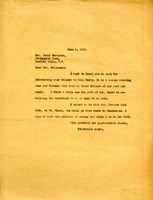 Miss Berry also says that she hopes to see Mrs. Marquand when she is in New York. 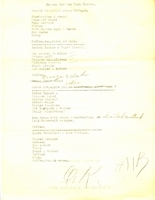 This document include the meals to be served on the second and third days of the "New York Guests'" stay.